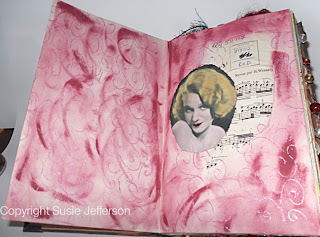 For this week's post I'm shorter on time than I'd like - so here's some pages from my altered book 'Caprices'. It's been a hysterical week - trying to list a book on Etsy and a clearout of rubber stamps and art supplies onto eBay - it takes FOREVER to list things. I've also put the last of my videos onto YouTube and my page here - it all takes time (see post below as well)! So I haven't even managed to do much Pink Saturday visiting! I'll try to do better this week and catch up a bit. Happy pink saturday, sweetpea! As you can see I finally got my "Pages" centered. "Blogger Help" has the answer. Susie, how clever of you to include both the door and the little drawer. What an interesting type book. I am not familiar with that. It certainly made for an interesting pink show today. 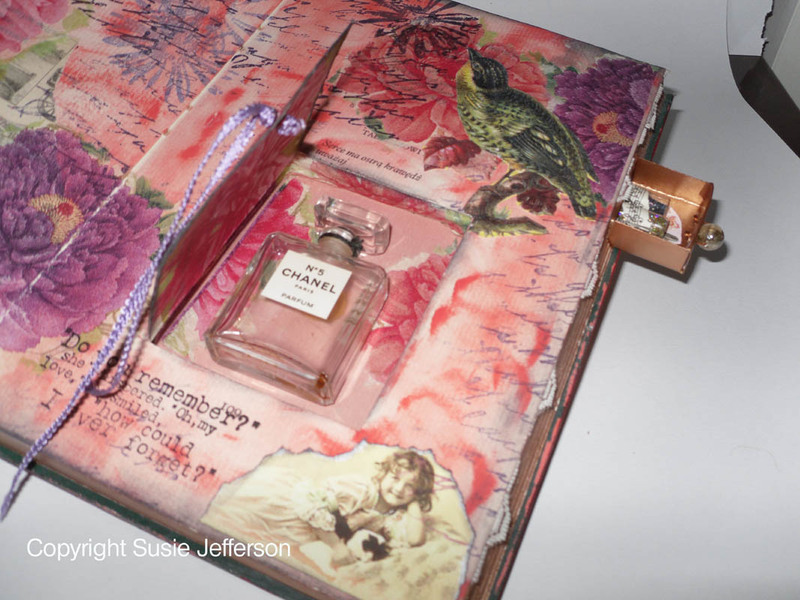 Love your altered book. An art group that I am in did a round robin a few years ago and we had 11 in the group. It was so much fun to see what everyone came up with. Yours is wonderful! What a gorgeous share this evening. I love this little book, and it is so special the way you added a little window for secret stashes, and a little drawer for treasures. Yes those little things are the element of surprise. Love them both. You are so talented sweet friend. I love it when you create, as when you create you share and I get to see your lovelies. Awesome, LOVE this book SO much. Susie, that book is so pretty. I keep saying that I am going to make one too but haven't done it yet. 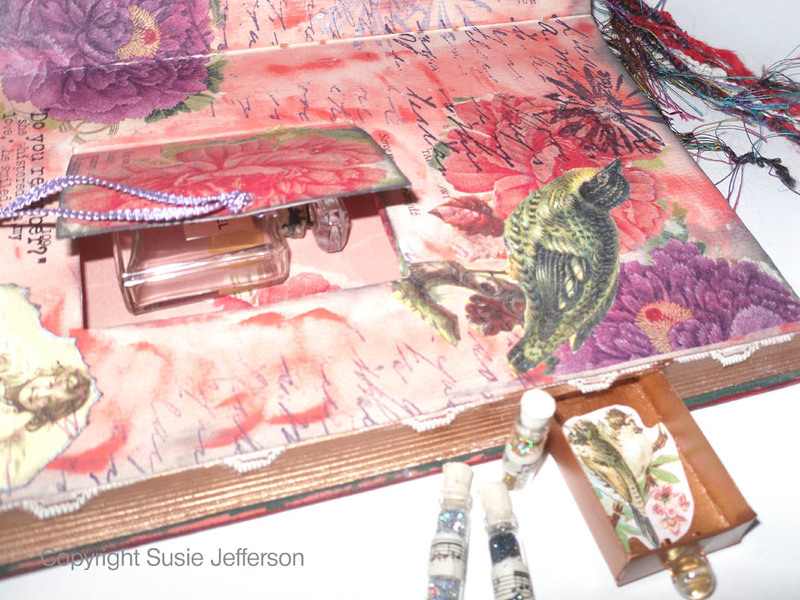 I love how you added the drawer and the niche for your perfume bottle. I love your altered book. That is very unique and gorgeous. You are so creative and I know that I can be on the computer way to long just doing a scrapbook page digitally. That project is just lovely. thx for taking tea with me @FHC! Wow! You are very creative! I am enjoying reading your blogs! How busy you are! Hope you are having a fabulous Pink Saturday! Happy Pink Saturday Susie, I'm so glad you stopped by to comment so that I could find you. I'm one of your new followers. I love your blogs. I'll be back often! Have a wonderful week. Wonderful journal! I love the hidden drawer especially!! Hope you have a fabulous pink week! I hope you had a happy Pink Saturday. Thank you for stopping by and leaving a post about the pink coat and beauty. Your remarks were spot on and I for one would prefer focus on beauty treatments such as kindness, laughter, etc. It's far better than botox! BTW -I love your videos. What a clever & beautiful book, Susie ... first time I've seen one like this. Pretty darn clever! Thanks for visiting me. They are so pretty. I like the Chanel bottle tucked inside! I think I read about the new Upstairs Downstairs. I'll have to go back to the website and see when they are showing it. Happy Pink Saturday Susie and have a great weekend! 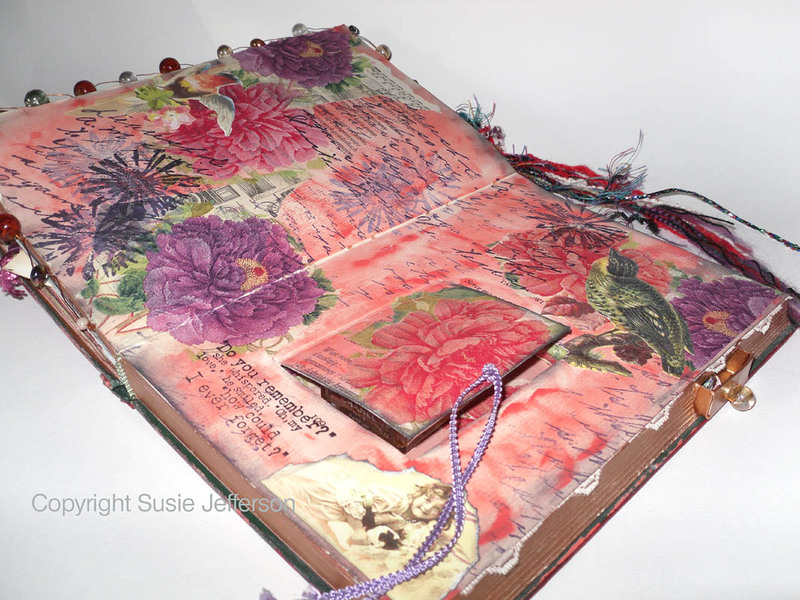 Your altered book is so pretty. I love the niche and the drawer! My altered books aren't nearly so pretty. The layers are really nice. Good job. Happy Pink Sat! HELLO AND HAPPY PINK SATURDAY~WHAT AN AMAZING BOOK :) I LOVE THIS!!!!! Thanks for you comments on my site. Your altered book is very elegant and creative! Wow beautiful and unique! HPS! Susie, I just love the book. Even more special with my fave No. 5 tucked inside. (I organized my closet and unpacked some items I had hidden for the move for safe keeping and found my own No. 5 today!) Great stuff on eBay. Watched the video on your next post and then was off to The Supper Club and found out they have a venue in San Francisco close by. I almost forgot to come back and leave a comment. Hope you are done with slushy weather. Have a great week. I'm slowly making my way through all the PS peeps. Wow, there are a lot this week! What a gorgeous book! I just love what you did with it, especially the Chanel perfume bottle. I'm still making my Pink Saturday rounds ~ thanks for your visit. Hope you are having a lovely week. Would you believe I'm almost jaelous ? !! !